I have quite a interesting topic to share with you guys. 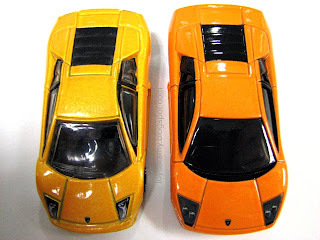 I found a old Hotwheels Lamborghini car from Ah Beng, by putting it next to the Tomica car, you could see the different Immediately. 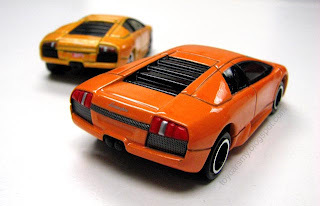 From all angles, the Tomica car looks better with finer finishing. The colour is more striking than the Hotwheels car. Tomica in Malaysia compared to HW... maybe the sole-distributor here not doing enough to promote it ! With Slightly extra price, you get better quality, why not.. or you can say HW made alot of $$ out of it. agreed regarding Tomy much better than HW.. But I think, Tomica can not compare with Hot Wheels about car's wheels. :) Wheels of Tomica are quite bad. DO you agree with me? Still... the hot wheel quality might have dropped slightly but I am very surprised and sad by the amazing quality drop to Darda Pull Back Cars and majorette die cast toy cars. Wrote articles on both subjects.